I remember the day I found out that Muammar Gaddafi, Libya’s former leader, had been killed. I was in the Bosua Beach Hotel in southern Ghana when CNN ran one of their “breaking news” inserts: endless repetitions of sparse facts and interviews with babbling heads offering wild and unfounded opinions about what would happen next. I met many black Africans who had worked in Libya. The money was good, they said, but their treatment was abysmal. They were never anything but second class citizens. Police would stop them because they were black, extort bribes, and often deport them. The Africans put up with this because the money was better than anything they could earn back home, or because their ultimate destination was Europe. The frayed cords of racial harmony held in check by Gaddafi’s men snapped once NATO unleashed the dogs of war. When the bombs started raining down over Tripoli and gangs roamed the streets in search of targets, the Africans turned for home and ran. They boarded buses for Mali, Burkina Faso, Niger, Ivory Coast, Nigeria and Ghana. Some clambered aboard boats bound for Italy. Their dreams of a better life incinerated around them in a matter of days. One returnee had an interesting story to tell. His name is Kwame, and he is 27 years old. He is one of 23 survivors from a boating catastrophe that killed more than 260 people attempting to cross from Libya to Italy in 2008. That he survived a horrible boating disaster at sea is remarkable enough. But tragedy struck twice in the space of three years when the Nato bombs started falling in 2011, and he was forced to flee Libya for his home in Ghana. Kwame has a look of self-assurance that sometimes inhabits those who have faced the worst of all possible endings, and somehow lived. God had a purpose for him, he assured me. That is why he was spared. He had an easy smile and a gentle manner. Some weeks earlier I had hired him to do some construction work, and I was impressed with his work ethic and endurance. The other workers called him “Libya bugger” and I asked why so. Then he told his story. A year before the disaster, Kwame had travelled east to Nigeria, working odd jobs to pay his fare north, and then boarded a series of buses across the Sahara to Libya. Once there, he tapped into the Ghanaian network of expats and illegal immigrants and found work in construction. Libya was a way-stop to Italy, where he would live for a period as a refugee, and then be granted a work permit. He would then be able to earn euros and accumulate enough funds to build a house for his family back home. When the day came to set sail from Libya, he and his friends arrived port side with all their belongings wrapped in the type of brightly coloured plastic hold-alls seen all over Africa. They jostled for space, some 260 of them, in a boat designed to carry half that number. Most of the passengers were Ghanaian and Nigerian, with a smattering from surrounding countries. The boat left Libya at five in the morning and all was well as they headed out into international waters between Africa and Sicily. Around 11:30 that morning, the weather turned foul, and waves breached the bow of the boat in one merciless pulse after another. Within minutes, the flimsy craft started to disintegrate. The passengers, many of them women clutching young children, were washed overboard never to be seen again. Kwame could not swim, yet he survived by clinging to a piece of floating wood as the boat and most of its passengers went down in the mayhem of disintegrating woodwork. While most of his friends perished in the tragedy, he fought and spat and kicked against the tumult. Some hours later, a Tunisian fishing vessel came to the rescue. Kwame was unconscious when he was plucked from the water along with 22 other survivors. Exhausted, dehydrated and near death, he was taken to Tunis and given medical attention, and then locked up in prison as the Tunisian authorities debated what to do with the survivors. A few days later, he and his fellow survivors were driven to the Libyan border and frog-marched to the other side, leaving them exactly where they started, but without money or shelter. 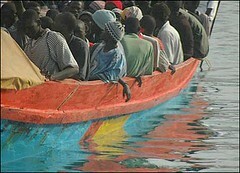 Undaunted by this tragedy, Kwame again found work in Libya and started saving money for yet another boat fare to Italy. Then the Nato blitzkrieg blackened the skies above Tripoli, and armed gangs marked out their turf. Kwame grabbed his few belongings and, like thousands of other Africans, bolted for home. Still today, his dreams of making it to Europe remain undimmed. He will, he assured me, attempt the journey again. “Life is good there,” he replied. I left it at that. I did not want to poison his dreams. *According to UNHCR (the UN Refugee Agency) estimates, more than 1,500 people drowned or went missing while attempting to cross the Mediterranean to reach Europe in 2011. This makes 2011 the deadliest year for this region since UNHCR started to record these statistics in 2006. The previous high was in 2007 when 630 people were reported dead or missing.